RIO DE JANEIRO — Sukhoi Civil Aircraft Company turned heads from the Olympics for a moment earlier this week to its new SportJet, a plane custom-designed to carry professional athletes. The aircraft is divided into four zones: a recovery zone with physiotherapy equipment, a resting zone with a massage bed, a coaching zone with an interactive screen for planning game strategies and an administration zone, according to a Sukhoi press release. “There is a significant lack of that kind of product in today’s sports travel market,” said Evgeniy Andrachnikov, senior vice president of sales at Sukhoi, at an event at the Marimbas Club at Copacabana Beach that included a full-scale model of the plane’s interior. Andrachnikov said the company has not yet set a price for the SportJet, but it is expected to be less expensive than typical team charter planes both in initial cost and operating costs due to its smaller size. The plane is meant to carry about 60 people — ideal for most major professional sports teams, Andrachnikov said. He explained that many teams buy defunct aircraft from airline companies, meaning they often have less than 50 people on a plane built to carry 180 or more. Andrachnikov said this results in teams spending larger than necessary amounts of money on fuel and maintenance while traveling in a plane that was designed for commercial air travel. “All these aircraft have nothing to do with the medical and IT solutions which we have in ours,” Andrachnikov said. Andrachnikov said teams need to do a better job of facilitating rest and recovery in the air, considering the amount of time they spend on the road. “During the regular season, each team spends pretty much 50 percent of their time in the air traveling to away games regularly,” Andrachnikov said. 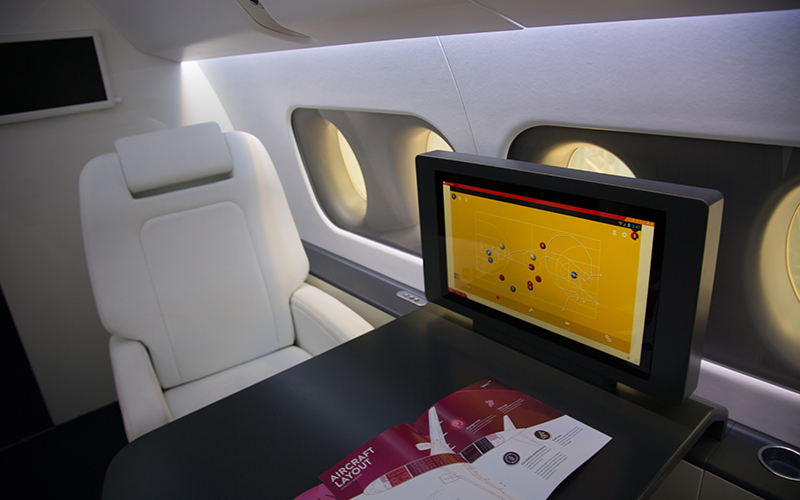 Advanced health technology is integrated throughout the plane, including wearable monitors that track athletes’ sleep and vitals, a “smart toilet” that measures hydration and a massage table where athletes can recover and receive medical treatment. Despite the gadgets, the most innovative part of the plane is the software on board, said Irina Zelenkova, a physician and exercise physiologist from the Russian Olympic Committee Innovation Center. Every analysis that the plane’s medical equipment makes is recorded in the software so team physicians can better keep track of their athletes’ health, Zelenkova said. Athletes need to be fit as part of their livelihood, and team owners spend large amounts of money on their teams, Andrachnikov said. The SportJet is the first aircraft of its kind, and Sukhoi believes there is a high demand for such a product.